Lower super taken off #2. Fondant added to a top super in each, with bubble insulation..
Wasps gaining entry to #1 in particular so investigated the bottom super. It was completley empty and very few bees in it. So I removed it and put the hive together again. Noticed that the bees were now defending a lot more effectivly. Having a vacant lower super is obviously not a good idea.I also pushed in the bottom drop boards to reduce behive aromas which wasps will surely home in on. Both hives treated with oxalic acid vapour. Cleaned up frames and 2nd super removed from both colonies. Cleaned up frames removed and extra capped ones added. They are reluctant to uncap them it seems so I did it for them. In the evening gave them a dose of oxalic acid fumes. Need to do this again later in Sept with 3 staggered doses, 5 days apart. Oct 15th is 1st opportunity. And also with the super removed so that the bin bag reaches the ground. Three partially full frames of capped honey put in top supers above crown boards on each hive. On both hives, a single super was positioned beneath the brood chamber, no excluder. Spare super from #1 taken off for possible extraction. Bees fairly calm about it all. Wasps not a big problem, they'll have plenty of wounded bees to despatch after this exercise. Supers about 70% full. Inspected #1 hive. Loads of brood, Brood chamber has one frame of honey stores. Two supers about 70% full, (about 20Kg net for both). Total hive 38Kg . Inspected #2 hive. Loads of brood, no honey stores at all in brood chamber. One super about 70% full (about 14Kg net) . 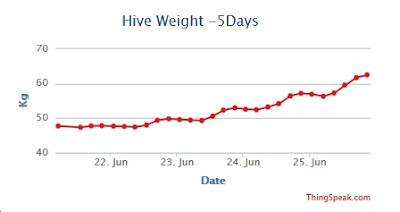 Total hive 31.5Kg - 2.0Kg = 29.5Kg - not a bad winter start weight. Inspected #1 hive. Plenty of brood and good honey stores forming in brood chamber. Two supers about 60% so left them on. Checked load cell zero - it was -0.6Kg. So actual total weight is 33Kg. Inspected nuc, now showing good brood. Ready to be sold I think. #Nuc1 (the swarm below that I put into a nuc 7 days ago) inspected. Actually saw the queen, but then there aren't that many bees in there. They've stored the syrup nicely,around a central space for the eggs - but none yet visible. Three central frames well utilised. Extracted and bottled about 60lb of honey. Returned a single super to each colony for cleaning. However discovered a 'cluster' on the cabin. No weight drop shows on monitor. No Qcells 3 days ago. Congestion/overheating? Or could it be a outside swarm? Inspector Noel Parker called to check the bees. Didn't find any issues and I picked up a lot of information. So nice to work with somebody. Colony #1 Two supers removed and an empty super added - above the brood box (Noel's suggestion). Colony #2 Two supers removed and a new one added above the brood box again. Plus 3 super frames in the brood box changed out for drawn brood frames. The old frames are on top of the crown board hopefully to be taken down. This colony has plenty of home-building to do now. Top supers taken off after cleaning up. They had capped a lot of cells so they may have stored again. Supers left on clearer boards. Weight drop was 4Kg for each hive. Two wet supers placed on each hive, one below the crown board, one above. 22Kg - 6.5 Kg (2 full dry supers) -> 15.5Kg (34lb) honey returned to hives. A 4th gallon of mead started, with 4lb reclaimed honey. Initial SG 0.85 but there was a lot of undisolved honey so probably doesn't mean that much. Extracted from the 4 supers pulled yesterday. 75lbs of honey - a record for me. But there's probably about another 50lbs left on the two hives. And they may pull in a lot more if the weather contimues hot. Had a delivery of 144 jars today, sadly couldn't wait for the KBKA much cheaper bulk order, which doesn't arive until mid Aug.
My guess of 35Kg (77lb) was very accurate - I didn't bottle that much but I am returning 3 frames to the bees as they are not capped at all. Would have been nearer 40Kg if I'd spun those 3 frames. Today was 6hrs work - a lot of effort. Carried out a dawn raid (well, 7:30am) and removed the lower two of the 4 supers from each colony. Put the supers on two separate stands with clearer boards. Hopefully the bees will be out by tonight. Lower supers full and about 95% capped, top two supers I would guess at 80% full and 50% capped. Dripping in sweat even at 8am (me, not the bees - they were surprisingly blasé about their honey loss, I was anticipating them giving me really bad time). So tomorrow looks like being another hard day at the spinning machine. About 35Kg of honey to be bottled at a guess. Monitor system on hive #2 updated to dual channel A/D input. They now have 4 supers each. Both colonies pulling in about 5Kg a day so considering doing some extraction. Reluctantly. Colony #1 (which is now #3 on the monitoring sysytem so I'll call it colony #3 from now on) now has a 4th super. The weight went from 62Kg to 65.2Kg, so 3.2Kg for the super full of drawn out frames. This lot has increased from 46Kg to 62Kg ie. 16Kg in 6 days. So 65 - 4x3.2 - 13 = 41Kg bees/honey on the supers. So I would guess 40Kg honey. 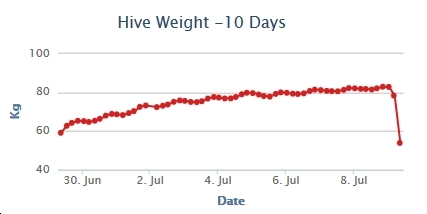 Colony #2 is now at 63Kg, up from 49Kg, 14Kg in 12 days. So 63 - 4x3.2 - 18 = 32Kg bees/honey on the supers. Another 30Kg honey? Whatever happened to the June gap? I'm now out of supers. Colony #1 inspected. No Q cells, lots of brood/larvae. Quite agressive so did not linger. Rotated hive 90 degrees for better Cabin viewing. Weight without supers was 13Kg, with 3 supers 46Kg. Colony #2 inspected. No Q cells, plenty of brood. Far frame wchich was a sper frame is a bit of a mess, nees removing as soon as the brood hatches out, hopefully they won't lay more eggs in it. Weight with supers removed was 18Kg, with 4 supers 49Kg. So about 25Kg honey on supers, overall half full. Now boxed up with 4 supers. Should keep them busy enough. A mound of paper and no dead bees - so the merger seems to have gone well. Removed the top brood box and added a fairly full super and put the combined #3 on the monitor plinth. From now on I'll refer to it as colony #1. Took the oppotunity to calibrate the zero and FS (with a 23Kg bag of sand). So it now has 3 supers and a total weight of 42Kg. Hopefully I can let them get on with things now. Colony #1 still has no sign of a queen so it has been combined with #3. Nuc colony inspected, pleanty of eggs but no larvae. Can't understand that. Will leave a week then possibly recombine if no progress. The full super was taken off hive #2 - concerned it may solidify. As an experiment I removed the capping and put the frames upside down in a plastic box to drain. I was trying to avoid another spinner exercise. The temperature rose to 39C and the honey drained well, but only about a third was harvested. For some reason it was retained by the cells. So had to give the bees the frames back to clean up. Not an experiment to repeat, but worth trying. This colony now has 3 supers, plus one to clean up. Inspected the swarm in the Nuc - eggs, no larvae so the queen is a virgin no more! But they have a lot of work to do to get a viable colony going so will leave them to it for a few weeks. Cleaned up frames taken off colony #3. Brood inspected: no Qcells, plenty of eggs and brood/larvae. Two frames still to be drawn out. 1st super about 60% full, 2nd super added. A plate of cappings added above crown board. A strong colony, and not agressive. Cleaned up frames taken off colony #2. Brood inspected: Eggs/larvae/brood, no Qcells. The 3 super frames were moved to the end and replaced by frames that need pulling - hope they can cope. Really need to get rid of the super frames in the brood chamber. Super #1 about 95% full & capped, #2 about 60%. Added a 3rd super. A plate of cappings added above crown board. Now a strong colony, and not agressive. Swarm Nuc not inspected at this time. Now 17 days since captured so will check them in a few days. Cleaded up frames taken off colony #1 and a plate of cappings added above crown board. No inspection yet but as the split was 10th May (3 weeks ago) and Q cells noted 23rd May (8 days ago). I may go in shortly, in a few days when the cappings have been cleaned. Honey spun off 4 supers and a few brood frames. Must find a better way of dealing with the brood frames. 60 lbs of honey. Wet supers distributed between hives 1,2,3. Surprise, surprise, hive #1 swarmed at around 2pm. Alerted to them by the 'horse-girl' in field at bottom. Was mowing the grass and heard her phoning someone about a 'black blob' on the fence and was concerned for the horses. An easy capture, straight into a nuc and I gave the girl a jar of honey for her troubles! They seem to have swarmed with a virgin queen! It was a queenless colony making Qcells when I looked on Wed so I let them get on with it. Went in later to reduce the queen cells to one. Been away on holiday so 1st inspection for almost two weeks. Hive #2 has been pulling in 2Kg the last few days so expected queen cells - but not a sign. They are still building up the brood chamber after a slow start. The two supers are about 80% full, no cappings, so put them back. Brood, lavae and a eggs so check again in a week. Hive #1 is the split wher I think I put the queen. However I got it wrong, there are no larvae or eggs just an awful lot of honey. There are a few queen cells so they are obviously trying to compensate for my bad bee-keeping by making a new queen. Remove two brood frames of honey and two supers of mainly capped honey. Gave them an empty super. In spite of loosing the queen they have been pulling in over 2Kg a day in the recent fine weather. Hive #3 is the other half of the split and this I now know is where the queen ended up. Larvae & a few eggs, plus brood. The brood chamber is a bit messy, no regular patterns. Removed one super. So I got the split wrong, however as I wasn't sure, I left eggs in both boxes so the bees could sort out my mess - which they seem to be doing. Hive #1 pulling in over 2Kg a day over last 4 days so went in fully expecting queen cells and prepared for a split. I was right. Moved the hive to one side and put a new box on original site to take the queen. However I couldn't find her. Decided to resort to a logical sort of frames. covered the central two and removed frames from both sides to drive the queen into the dark. Then moved the central two frames into the new box. And put one super on each (supers very heavy). No idea if the queen is now in the new box and on reflection should have gone for plan B, except that I' didn't have a plan B. A day later all the flying bees are on the original site and the old hive is deathly quiet. I'll just have to let them get on with it and hope. Hive #2 has been pulling in about 0.5Kg a day and has a lot of chamber building to do so didn't expect any queen cells. Right again. So boxed them up and hopefully they will expand, they are still a weak colony so not expecting trouble from that quarter for a month if at all. Both hives inspected, all looks good, eggs, larvae, brood (M&F). And for the first time I saw not one but both queens! Maybe now I have my eye in I'll see them again. Both colonies very placid - warm clam weather probably a factor. No sign of queen cells. Colony #1 very much stronger than #1, which has a lot of work to do on the brood chamber frames. 1st super on each has honey and the 2nd super centre frames are starting to be worked. Hive #1 inspected. Good brood & larvae. Stores going into 1st super so added a second. Feeder removed. Plenty of bees, could be in swarm mode in a week or two. Hive #2 inspected. A much weaker colony but looking good. Brood has 3 sper frames one on which has been nicely extended down. New broom frame inserted into brood area. One super removed. Some stores going into super so added a 2nd but it will be several weeks before they need it. Both hives given a pint of syrop to tide them over a current cool spell. #1 had fondant left but hadn't taken much so I removed it. First inspection since last September, all of 6 months ago. Today is the first summer-like day this year so an opportunity not to be missed. Hive #1 - this had a super of stores below a brood chamber. Super now almost empty and 2/3 full frams of stores in brood chamber. Eggs/larvae and brood in the main chamber. Two full frames replaced by empty frames and an empty super put of top. Back to a configuration I'm happier with. Plenty of bees in there and a lot of pollen being stashed away. Hive #2 - this was a brood and a half with a super above. Inspection revealed brood and larvae in the supper but very little of much in the brood chamber. the 4 super frames with the 'nest' were moved into the brood chamber together with some food frames and empty frame. Super with 2/3 frames of partial food put on top. About half the strength of #1.